romanticism artist. German, 1776-1812 German painter. 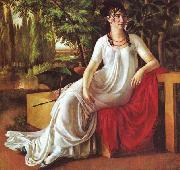 He trained at the H?he Karlsschule in Stuttgart (1795-7) under the classically-orientated painter Philipp Friedrich von Hetsch (1758-1839), a pupil of David. Schick also took private lessons (1797-8) with the sculptor Johann Heinrich von Dannecker. 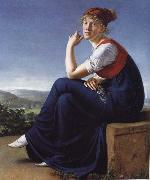 From 1799 to 1802 Schick studied in Paris under David, and he soon became one of David's favourite students. He made two unsuccessful attempts to win the Prix de Rome with compositions that derived from the style of David. However, greater independence is seen in his life-size painting Eve (1800; Cologne, Wallraf-Richartz-Mus. ), a magnificent allegory of Beauty synthesizing a classically-orientated reinterpretation of ancient art and a proto-Romantic interpretation of biblical subject-matter, inspired by Milton's Paradise Lost. As Schick himself stated (letter to Dannecker, 10 July 1800), he had tried to emulate both the Medici Venus and the female figures of Raphael. In 1802, on a pension from Frederick II, Duke of Werttemburg, Schick moved to Rome and for almost a decade played a leading role in Roman artistic life. His friendship with Joseph Anton Koch led to mutual influence in the work of the two artists. Koch was indebted to Schick for invaluable hints on oil painting and for choice of subjects. For a fortnight in July 1805, Schick exhibited in the Pantheon his large oil painting The Sacrifice of Noah (2.50*3.27 m, 1804; Stuttgart, Staatsgal.). The work was inspired by Raphael's Old Testament frescoes in the Vatican Loggie; and it brought Schick enormous success. Despite financial hardship, Schick continued to work indefatigably, and without waiting for commissions, on a wide variety of projects. These included biblical and mythological subjects as well as portraits. Between 1806 and 1808 he completed his Apollo among the Shepherds (Stuttgart, Staatsgal. 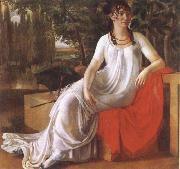 ), a subject he had attempted while still in Paris and then again in Rome in 1805. The second Rome version had clearly gained through Schick's concentrated thought over a period of several years, and the result represented an avowal of faith both in the artist's own gifts and in German Classicism.